Like Danny Santana and Oswaldo Arcia, Michael Tonkin is out of options. Also akin to Santana and Arcia, Tonkin made the opening day roster. he's low man on the totem pole, so he gets the scut work until he proves he deserves a more pivotal role. My guess, to be blunt, is that he'll be waived before the end of April. Or DL'd if it turns out he can't physically handle going through the entire order. Tonkin has been up-and-down with the Twins for three years, with five separate callups in 2015 alone. My theory on why the Twins have been so reluctant to give Tonkin a real opportunity in the majors: He's as awkward as I've seen in pitchers fielding practice in spring training. That sounds minor, but managers and pitching coaches will (and should) always be wary of the guys who beat themselves. Tonkin is a tall (6-7) guy who, in my scattered viewing of PFP over years, tends to muff bunts and throw balls into the dirt when throwing to bases. 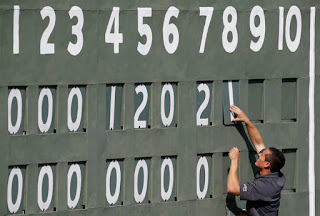 Managers know they're going to lose some games, but they particularly hate to lose them because a pitcher threw a ball down the right field line with two on in the eighth inning. Paul Molitor (and Ron Gardenhire before him) watches the PFPs pretty intently; if Tonkin messes up two plays a day, that's going to stick with them. what Tyler Duffey's doing here. Ricky Nolasco was indeed named the fifth starter on Tuesday and Tyler Duffey was indeed optioned out to Rochester. I am trying to be sanguine about this. As I've said in recent posts, the Twins (and virtually every other team) will use about eight starting pitchers in the coming season. Duffey will almost certainly be one of them even if he doesn't open the season in Minnesota. But to the extent that Duffey lost the rotation spot that he had been penciled in for because he was trying to develop his changeup -- as opposed to, perhaps, pitching poorly as the result of his workload increase last season -- well, that's irritating because it probably wasn't necessary. The pitching repertoire lists show Duffey as a two-pitch pitcher. The Bill James Handbook says Duffey threw 58 percent fastballs last year with the Twins, 40 percent curves, 2 percent changes. By all accounts, Duffey put the change "in his back pocket" down the stretch. But ... he throws two fastballs and two curves, as detailed in this Fangraphs piece. (The piece was posted Tuesday just before Duffey's demotion was announced.) Duffey throws both the two-seam fastball (aka sinker) and the four-seam fastball. And he throws two distinct types of curves, with different speeds and "shapes." That's four pitches, not two. Now, there is an oddity about the fastballs; Most two-fastball pitchers get noticeably greater velocity out of their four-seamer than from their two-seamer. Duffey says his are about the same speed. So maybe the fastballs would more accurately count as 1.5, but he clearly thinks of them as different pitches. One moves, the other does not. Anyway, the change would be a fifth pitch, and there comes a point for any pitcher when the repertoire becomes too large. Neil Allen, the Twins pitching coach, believes strongly in the changeup, and for most pitchers that's legitimate. Duffey himself in the Fangraphs piece sounds convinced that he'll need an effective changeup. I'm not so sure. I'm afraid the push for a change is fixing something that wasn't broken, until they broke it. Neither Tyler Duffey -- who pitched the "major league" games against a collection of Pirates scrubs in Bradenton -- nor Ricky Nolasco -- who pitched against minor leaguers on a back field at the Twins complex in Fort Myers -- was all that impressive Monday. Nolasco through 5: 4 2/3 IP, 5 hits, 2 xbh, 3 runs, 2 earned, 2 walks, 5 Ks, 1 WP. 84 pitches, 55 strikes. Still, a decision on the fifth starter's job is expected this morning, and the conventional wisdom has it that Nolasco -- with a superficially superior spring training ERA, inflexible roster status and $25 million owed him over the next two years -- will get the nod. The best case for going with Duffey is probably this: He was told going into camp that he was penciled into the rotation and he should focus on working on his changeup. He worked on his changeup and got shelled. If he gets demoted today, there's a genuine possibility that he'll go away believing that he was either lied to or set up to fail. 1) Nolasco (or somebody else in the rotation) gets hurt or fails and Duffey is recalled to take his place. 2) The five starters all make 30 or more starts and throw 200 or so innings, in which case nobody's going to criticize management. It would also be the first time, I believe, that the Twins have had five starters make at least 30 starts apiece. So that second outcome is unlikely. Bottom line: If Duffey isn't in the rotation to open the season, he's likely to be in the rotation at some point. Shortly after I published Saturday's post, the Twins announced the rest of their position player cuts. The result is a 13-man group that offers few if any surprises. The two bench jobs that were arguably in dispute went to the two younger, out-of-options guys, Oswaldo Arcia and Danny Santana. The Twins granted Carlos Quentin a few days to examine his options. The veteran non-roster invitee had an impressive spring, but four-man benches are tough to crack if all one has to offer is a bat. Quentin was never a good defensive outfielder when he was young; now he's 33 and has had repeated leg injuries. Arcia is said to be a better defensive outfielder now than in previous years (he's taken some weight off), he's left-handed and he is almost a decade younger. Plus, as noted, he's out of options. So we can assume Quentin's agent is calling a few clubs that might be in need of a pinch hit specialist or even a designated hitter, but my guess is that those few jobs are already filled. If somehow there is a major-league job out there for Quentin, I presume the Twins will release Q (why else would they let him look?). But I doubt that will be necessary. The pitching staff won't be set until the fifth starter job is settled in the next couple of days. I devoted the Monday print column to the Tyler Duffey vs Ricky Nolasco competition for that job. I go back and forth on this one, really. I can defend going with either pitcher in the rotation. What I can't defend, and hope the Twins don't try to use as a rationale, is basing the decision on spring training stats. Neither will have much more than a dozen Grapefruit League innings; that wouldn't be enough to draw a statistical conclusion on in regular season play, much less March. Anyway: If Nolasco makes the rotation, Duffey goes to Rochester and there's a extra bullpen job available. If Duffey is the fifth piece of the rotation, either Nolasco goes to the 'pen (probable) or gets traded (less likely). If traded, there is, again, a bullpen spot available; if not, somebody else gets squeezed out. before their exhibition game in Havana on Tuesday. Cuban president Raul Castro looks on at center. There were probably better photographs available this week, but the Cuba game was significant for more than baseball, and I chose this week to acknowledge that. The Twins trimmed their camp roster to 35 Friday by optioning out Max Kepler and releasing Ryan Sweeney, both left-handed hitting outfielders. Sweeney is about eight years older than Kepler, and his days as a regular are in the past. His goal is to be a bench piece, and he appears to have a grasp of reality; he sounded grateful to be cut loose at this point because he has 10 days to find another team before the start of the season. The Twins simply have too many outfielders who are younger, stronger and faster than Sweeney. Sweeney would have had a better chance 30 years ago, when teams carried just 10 pitchers. The Twins are likely to have just one full-time outfielder on their bench. I figure the four extra position players will be John Ryan Murphy (catcher), Eduardo Nunez (infielder), Oswaldo Arcia (outfielder) and Danny Santana (infielder-outfielder). That would also leave Darin Mastroianni and Carlos Quentin off the roster. While I could make a case for Mastroianni as a defensive specialist, I have a difficult time seeing how Quentin fits on the current roster. He can hit, but that's all he can do to help, and the DH slot is well-occupied. I took note about a week ago of Terry Ryan saying that the Twins might have more starters for Triple A Rochester than they have slots. He knew (naturally) what he was talking about. Start with Jose Berrios, the team's top pitch prospect. Alex Meyer's major league future, if any, is probably in the bullpen, but he's going to start at Rochester to get innings. Taylor Rogers, who made 27 starts for Rochester last year and was sent out this week, figures to start there; so does Pat Dean, who also started 27 times for the Red Wings in 2015 and was part of the first wave of cuts. That's four. We've accounted for four of the five rotation spots without figuring in any promotions for Double A Chattanooga -- which, you may recall, won the Southern League title. Some pitchers from the Lookouts might merit a move up the ladder, the most likely being Brett Lee and D.J. Baxendale. Then there's Logan Darnell, who spent most of 2015 in the Red Wings bullpen but made seven strong starts at the end of the season. Darnell, a lefty, is still in major league camp as a non-roster invitee. 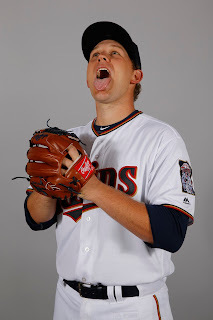 An added wild card in all this is Tyler Duffey, who has not had a good spring and may get squeezed out of the major league rotation despite his impressive finish to the 2015 season. One factor working against Duffey: He has options. The other starters do not. It's possible that some team looking to plug a rotation hole would take Ricky Nolasco off the Twins hands. It's possible that the Twins will stick with Duffey and risk Nolasco's discontent with a bullpen assignment. It's also possible that the Twins will take the path of maximum flexibility and demote Duffey to start the season. Remember: Teams have to expect to use at least eight starters over the course of a season. They have to have starting depth, and some of that depth has to be optionable. Duffey is optionable. Boshers' departure is no surprise. Graham, who spent last season on the major league roster as a Rule 5 guy, no longer has that protection; if anything, I am surprised it took this long for the Twins to send him out. Rogers, on the other hand, I genuinely thought would wind up coming north. 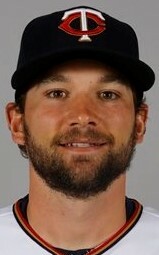 The Twins also on Wednesday outrighted Mike Strong, the Minnesota-born lefty they sent out in the first wave of cuts. This opens a slot on the 40-man roster, and the expectation is that it will be filled by Fernando Abad, veteran lefty reliever in camp as a non-roster invitee. Which brings us, more or less, to Nolasco. Nolasco threw six shutout innings in the major league game, albeit against a minor league lineup. 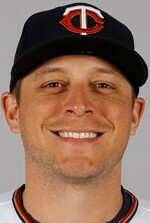 (The Rays took their major league lineup to Havana on Tuesday, then spent seven hours trapped on the tarmac by mechanical issues and ultimately arrived back in Port Charlotte around 5 a.m.) Tyler Duffey also pitched to a minor league lineup in a minor league game and got lit up. Nolasco has now pitched 13.1 innings in Grapefruit League play to a 4.05 ERA, Duffey, 8.1 innings, 6.48 (minor league games such as Wednesday's not included). It would be foolish to judge the two on the basis of less than 23 combined innings; of more significance would be how their stuff looks, the quality of competition, what they're working on, and so forth. The Twins entered camp with three starters written into their rotation in ink (Ervin Santana, Kyle Gibson and Phil Hughes) and one more in pencil (Duffey). Duffey has spluttered this spring, in part, perhaps, because he is trying to develop a straight change. There is speculation that the eraser is out for Duffey's rotation berth. I can see some silver linings to that development, but it is not my first choice, and it probably isn't the Twins' preference either. The Twins used Tuesday's split-squad games to showcase seven bullpen candidates. If anything, the performances made it all the tougher to boil down the competitors. Of particular note was Michael Tonkin, who had not fared well this spring. He fired two hitless innings against the Baltimore Orioles. I had about written him off already, but he's still in camp, still on the 40-man roster, still out of options and still coming off an impressive 2015 Triple A season (1.10 ERA in 41 innings). Nolasco remains a complication. I'd still love to see the veteran traded, but that will require a leap of faith on the part of some other club. He hasn't outperformed Tommy Milone or Tyler Duffey for a rotation berth, but his agent has already indicated that Nolasco won't take a bullpen assignment well, and I will be shocked if the Twins eat the $24 million owed him. But moving Nolasco out of the way would make it easier to fit an extra lefty in the pen, or to keep Tonkin around. One way or another, we may see some moves today to pare down the candidates. at Estadio Latinoamericano in Havana. Today baseball stands at a rare crossroads of history, diplomacy and commerce. The Tampa Bay Rays will play an exhibition game in Havana against the (depleted) Cuban national team, with the presidents of both the United States and Cuba in attendance and broadcast back to the United States on ESPN. The game serves as a centerpiece of President Obama's visit to the island nation and a symbol of the controversial thaw in relations. Baseball, the sport, may be our "national pastime," but it is also Cuba's obsession, and as such uniquely positioned for a role in the inevitable and necessary rapprochement between the two neighbors. This is a baseball blog, not one on politics or foreign policy. But today they are intertwined. For baseball the business, Cuba is a source of talent tainted by moral complexities, with rumors of kidnapping and extortion accompanying the defections of athletes. Someday, perhaps, Cuba will also become a source of revenues, although that will require more significant change on the island that I expect to see in my lifetime. For baseball the game, Cuba is a source of love and enthusiasm. 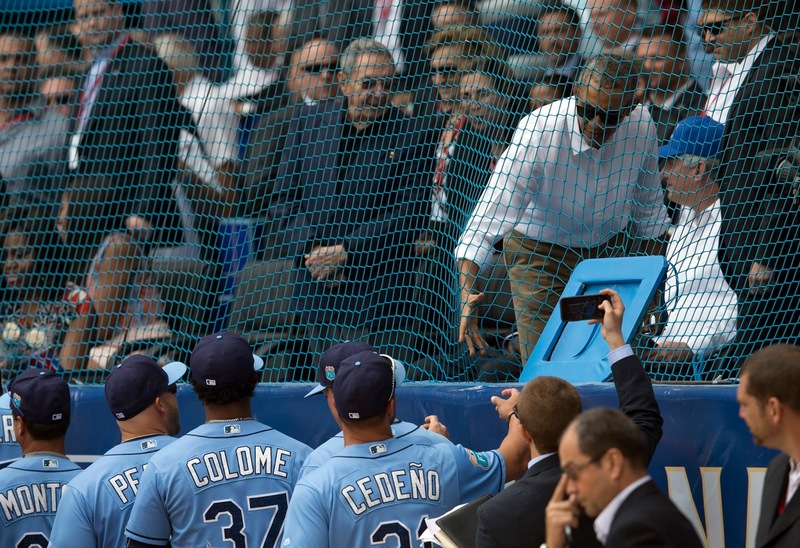 On that basis alone, baseball and its fans should embrace the change in the U.S.-Cuba relationship. Miguel Sano reaches for a fly ball in Sunday's game. He dropped it for his first charged error of the spring. The Monday print column highlighted the competition for the Twins reserve outfield role(s). 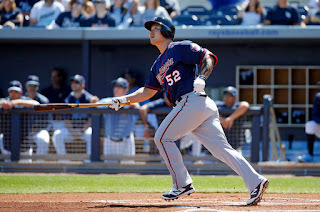 On Sunday, something happened that might have boosted the chances for somebody like Darin Mastroianni as opposed to somebody like Oswaldo Arcia: Miguel Sano committed an error in right field. The big man has not be tested often during exhibition games. This was, I believe, the second time the "ugly finder" rule -- the ball will find a poor fielder -- has come into play in spring training. I'd like to say two bad plays in three weeks isn't a terrible ratio, but it's spring training, and he's not playing every inning of every game. Back to first principles here: The Twins are not going to make a panic "it's isn't working" move. Sano is going to be the right fielder. There are going to be misplays. He's working on it. But Sunday's error highlights the question: Will Paul Molitor feel forced to use a more certain defensive right fielder late in close games? Obviously he'd rather keep Sano's bat in the lineup than remove him; leads can be lost without balls going to right field. pregame stretches of Toronto star Jose Batista. The Phillie Phanatic is generally regarded as the gold standard for costumed mascots. This is a pretty good example why. 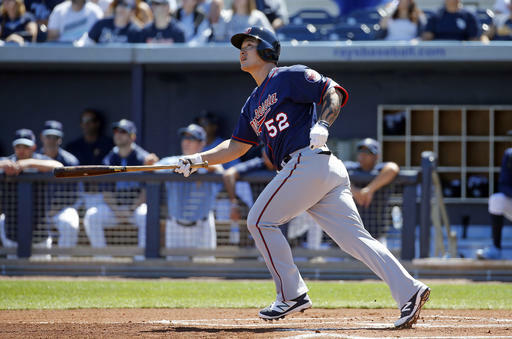 The Twins moved nine more players out of major league camp Friday. Reassigned: catchers Mitch Garver and Stuart Turner; outfielder Joe Benson; righties Jose Berrios and Nick Burdi; and lefty Aaron Thompson. Optioned: infielder Jorge Polanco, first baseman Kennys Vargas and righty Alex Meyer. A few recognizable names there, including (depending on who's doing the rankings) at least three Top 10 prospects, but nobody who was particularly likely to make the opening day roster barring injury. I am curious about the chatter today about whether Meyer will start or relieve in Rochester. Paul Molitor sees Meyer as a reliever, but there are apparently voices in the organization that want him starting again. And that might be part of that Terry Ryan quote from Thursday about more starters than slots in Rochester. My notion on this: Meyer may need to start for a while in order to get enough innings and repetitions get iron out his wonky mechanics. He has the stuff, but he has issues throwing quality strikes. He may need to start to get a chance to be effective in relief. Overbooking in @RocRedWings rotation could be an issue: "We may have more starters than slots," Ryan said. I might have to explore that a little for a future post, who all these Triple A starting candidates are. I doubt that the Twins would keep Rogers simply to open a Rochester rotation slot for somebody else, however. J.R. Graham didn't help himself (two-thirds of an inning, two runs allowed). Ryan Pressly struck out four in two innings but also gave up a long homer to Adam Jones. Fernando Abad, like Rogers a top contender for the lefty job, retired all four men he faced with one strikeout. The Twins may well make some roster moves today. With 10 outfielders and seven catchers still in camp, the next round of cuts probably won't be all pitchers. But I wouldn't be surprised if some of Thursday's arms aren't in major league camp this weekend. .290, as a reliever .250. Some notable things are happening in regards to the Twins opening bullpen these days. 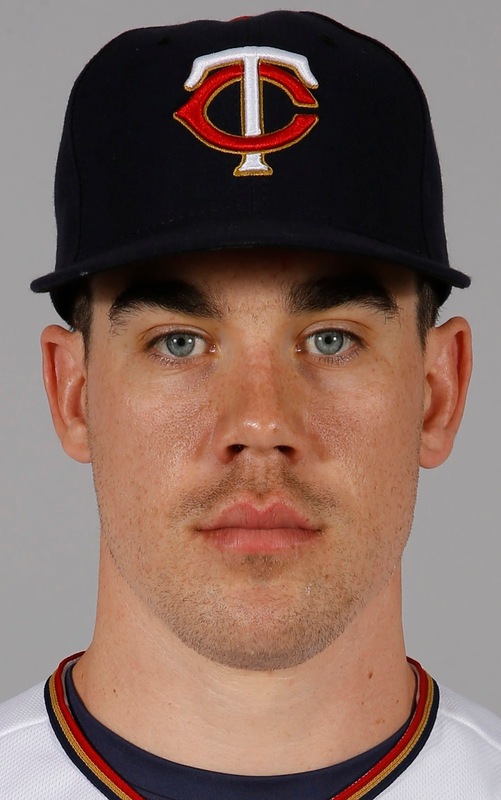 First: Trevor May was told Wednesday by Paul Molitor that he's going to open 2016 in the bullpen. This is hardly a surprise. As I saw it months ago, May ranks behind seven other starters -- Ervin Santana, Phil Hughes, Kyle Gibson, Tyler Duffey and Tommy Milone, the five who comprised the rotation down the stretch last year, plus the well-paid Ricky Nolasco and prize prospect Jose Berrios. Terry Ryan insisted Wednesday that the Twins still view May as a future starter; it's just that he fits better on this staff as a reliever. And maybe May will be a starter, but I'm pretty sure of this: He won't get that chance if the Twins keep throwing eight-figure salaries at veteran starters. Second: Michael Tonkin had a rough outing Wednesday night. Given the ninth inning against the Red Sox with a seven-run lead, the lanky righty struggled to get out of the inning. There was a misplay behind him, and a dribbler for an infield hit, and he did strike out two men, but there was also a drive over the right fielder's head and a hit batter and a lot of pitches. Tonkin is out of options. 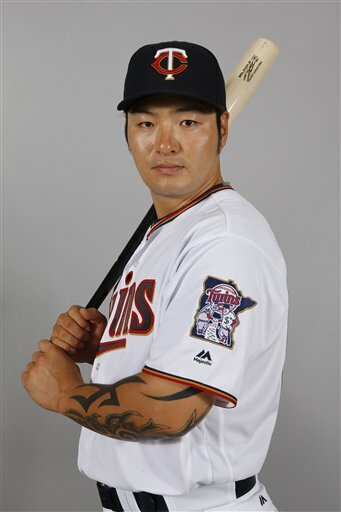 He's making it easy for the Twins to decide to expose him to waivers. Third: Tonight's exhibition game (at Sarasota against the Orioles) is going to be a bullpen game. That's a collection of arms on the bubble, including four lefties (Rogers, Abad, Darnell, O'Rourke). Hughes and May will stay in Fort Myers and pitch in a minor league game on a side field. Which makes sense. They are getting ready for the season. The guys going to Sarasota tonight are pitching for jobs. President Obama on Tuesday announced changes in how the U.S. embargo on Cuba will be enforced, and one of those changes is specifically aimed at opening up American professional baseball to Cuban residents. The new rules will allow Cubans to open U.S. bank accounts and allow Cubans living in the United States to earn a salary without establishing residency outside Cuba. The White House announcement specifically mentioned professional athletes, and baseball is the most obvious U.S. sport attracting Cubans. This is one necessary step in wresting control of the athletes into the U.S. market away from the human traffickers and smugglers, a dirty and dangerous business. But it's only one step. Major League Baseball is in talks with the Cuban government to let players sign directly with its teams, rather than flee Cuba and seek political asylum in the United States. Among the points of dispute apparently are how many players would come to American pro ball and whether they also could compete in the Cuban leagues. The reality is that most of the best of Cuba's talent has already fled the island, The Serie Nacional, the top Cuban league, has been severely dented by the defections. The Twins made their first round of camp cuts in two parts. Sunday afternoon they reassigned five non-roster invitees to minor league camp; Monday morning they optioned out seven players who are on the 40-man roster. There may be a practical reason for the reassignments in one wave and the options in the other, but I can't fathom what it would be, and it doesn't really matter. As should be expected in the early cuts, the players sent to the minor league camp are basically guys who didn't have a realistic chance of making the 25-man roster. RHP Yoman Landa and LPH Randy Rosario haven't pitched above low A ball. LHP Mason Melotakis is being handled gingerly in the wake of his October 2014 Tommy John surgery. OF Adam Brett Walker is having his throwing mechanics overhauled. LHP Pat Dean figures to be in the rotation for Triple A Rochester and needs to get innings. RHP J.T. Chargois was no surprise if only because the bullpen has its full complement of right-handed short men, with Kevin Jepsen, Casey Fien and (presumably) Trevor May. That leaves LHP Mike Strong, who I thought might get a longer look as a second lefty in the bullpen. He was the first serious LOOGY candidate out, though. Still around: NRIs Fernando Abad, Buddy Boshers, Dan Runzler and Aaron Thompson and roster guys Ryan O'Rourke and Taylor Rogers. Rogers and Abad are the most likely finalists, although I'm picking up good vibrations on Runzler. Also still around, apparently because pitching coach Neil Allen wanted to keep him for a while yet, is Nick Burdi. By implication, the plan had been to send him out in this wave. He faces the same numbers problem Chargois did, and I don't think he's going to escape the second round of cuts. So 12 players are gone, with 52 still in major league camp. They basically have to cut more than an entire active roster, so there are plenty of moves to come. A lot of them are pretty obvious as well -- there are still seven catchers in camp -- but some are going to take some thought. None of Sunday's reassigned five -- SS Engleb Vielma, 1B-OF Reynoldo Rodriguez, C-OF Alex Swim, RHP Jake Reed and IF Heiker Meneses -- had any realistic chance of making the 25-man roster. I did think Swim might last longer as the successor to the Dan Rohlfing role of "last non-roster catcher cut because he plays enough other positions that we can use him to sub for a regular." I suspect today's wave of cuts will include a few more pitchers. Speaking of Swim and catchers, the Monday print column this week actually saw print. (The sports editor apparently forgot to budget last week's.) It is, in effect, "Parsing the catchers, part four" and focuses on Kurt Suzuki and John Ryan Murphy, the duo expected to handle the catching duties this year for the major league team. I want to recommend to you this piece by ESPN 1500's Derek Wetmore about the Twins and medical technology. Injury prevention is the next big goal in baseball's "big data" revolution. It's good to see some evidence that that Twins are working on that. A week ago today I flew back from my all-too-brief excursion to spring training. But I was at this game, not that you can see me in the crowd. Twins vs. Orioles on Saturday, March 5. A good day for some baseball. But then, they all are. Juan Centeno and John Hicks; Stuart Turner and Carlos Paulino. Four catchers who spent 2015 at Triple A or Double A and who, barring injury, have little opportunity to move up the ladder in 2016. And coming up from behind, Mitch Garver and Alex Swim. If Turner and Paulino are catch-and-throw guys who offer little hitting, Garver and Swim might be the opposite. Garver's raw numbers last year at High A Fort Myers don't look like much -- his OPS fell almost 200 point from his 2014 in Low A Cedar Rapids -- but Hammond Stadium is notoriously difficult for hitters. Garver led the Miracle (who finished with the best overall record in their division of the Florida State League) in RBIs and doubles, and he had the best OPS of the six position players with at least 100 games played. Garver can hit. So, albeit with little power, can Swim, a left-handed hitter who gets much of his playing time in the outfield or at first base. Swim hit .311 in Cedar Rapids in 2014, and he hit .311 again in 2015 for Fort Myers, but with a total of 24 extra-base hits over the two seasons. They were drafted in the same draft as Turner (2013), Turner in the third round, Garver in the ninth and Swim in the 22nd. Turner was slotted a level above Garver from the beginning and has remained there, while Swim and Garver have moved up the ladder roughly in tandem, with Garver getting the priority in at-bats and innings behind the plate. Last summer, Terry Ryan said that if one could combine Turner and Garver -- Turner's defense and Garver's bat -- you'd have a pretty good catcher. That's not an option. Ryan and his colleagues will have a decision here soon, probably centering on Turner. Does he repeat Double A? If he does, what do you do with Garver? Garver is 25, and there's no point in him repeating High A (he was old for the league last year). The Twins remade their catching depth this winter, and now they have to sort it out. Stuart Turner is frequently on prospect lists for the Twins. Baseball America, for example, lists him this spring as the organization's No 16 prospect; MLB.com at No. 23. The 2013 third-rounder was regarded as the best collegiate catcher in the land his junior year. But he simply has not hit as a pro. His defensive chops will likely get him to the major leagues anyway, but he brings Drew Butera to mind: Good receiver, not good enough with the bat to be a regular. Still, virtually every list you'll find as Turner as the best catching prospect in the organization. He spent last summer in Double A Chattanooga, and so one would expect that he's ticketed for Triple A Rochester. Problem: One would also expect that John Hicks and Juan Centeno, the duo I discussed in part one, will be in Rochester. I doubt there's playing time for all three. Then there's Carlos Paulino, who split 2015 between Rochester and Chattanooga. Paulino's arm really stood out to me last week when I watched the catchers during infield and pitcher fielding drills; his throws made a audibly louder snap than anybody else's when they hit the infielder's glove. Paulino is a couple years older than Turner (who is himself less than a year younger than presumptive major league catcher John Ryan Murphy), and this is his third organization. He started in the Marlins system, then went to the Pirates chain. The Dominican has had only two seasons of more than 300 at-bats. so he's been basically a back-up catcher in the minors, hardly the fast track. There's a lot more to catcher defense than arm strength, of course; pitch-calling, pitch framing, pitch blocking. I'm hardly expert enough to evaluate Paulino's skills in those areas, or Turner's either. But I do see them running into a numbers crunch. There's four guys ahead of them at the next two steps up from Chattanooga, and, as I'll discuss in part three, two pushing up the ladder right behind them. Minor league teams often carry three catchers, and the Twins may have that in mind for their high-level farm clubs. Presumably Turner will be the playing time priority. But I doubt he's ever going to hit enough to make a genuine impact on the major league team. As is typical in spring training, the Twins have eight catchers in camp. It's a markedly different crew this year, however. Kurt Suzuki's still around, of course, but the other three backstops who spent time on the 40-man roster in 2015 -- Chris Herrmann, Eric Fryer and Josmil Pinto -- are all gone, as are Dan Rohlfing and Tyler Graves, two other non-roster invitee catchers for 2015 camp. The presumptive major leaguers, Suzuki and John Ryan Murphy. The cup-of-coffee imports, John Hicks and Juan Centeno. A pair of catch-and-throw high minors guys, Stuart Turner and Carlos Paulino. Two guys hoping to get out of A ball, Mitch Garver and Alex Swim. Hicks, who the Twins picked up on waivers early in the offseason from Seattle, is on the 40-man roster. He got 34 at-bats with the Mariners last year, and that's the extent of his major league time. Centeno, who was with Milwaukee last year and the Mets before that, has had 66 plate appearances spread out over three years; he's a non-roster invitee. They're both 26. Centeno hits left, Hicks right. Hicks' roster status probably gives him a leg up on Centeno, but the Twins would probably be just as happy if neither ever saw Target Field. That would mean Suzuki and Murphy remained healthy and productive enough to stay on the roster and in the lineup. Interesting, therefore, that the Braves will be the "home team" on July 3 when they and the Miami Marlins play on a new field at Fort Bragg, North Carolina. 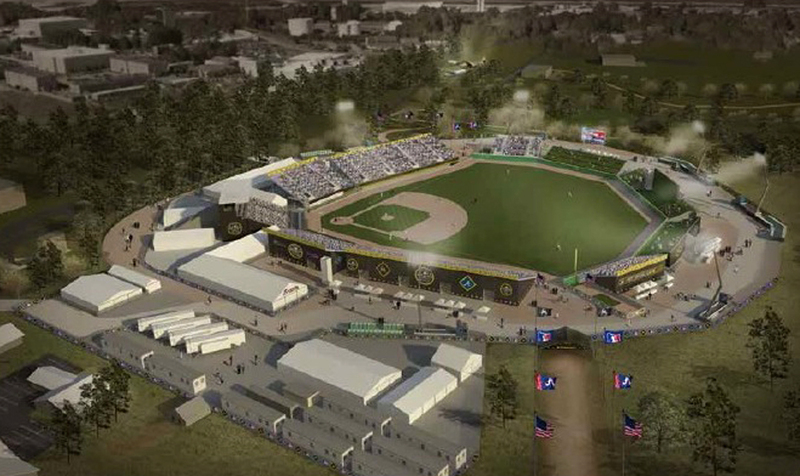 The field is being built at the Army base by MLB and the players union. After the game -- to be ESPN's Sunday Night Baseball game -- will be converted to a softball facility for the troops there. Which is all well and good as a one-time thing. But I hope this doesn't become an annual event in which MLB and the MLBPA pay for a new field at one installation or another and a regular-season game is played there every July 4 weekend. They can build the yards, that's fine, but after this, let's skip the self-congratulatory wallowing. The gesture will be more meaningful if it's not such an obvious publicity stunt. 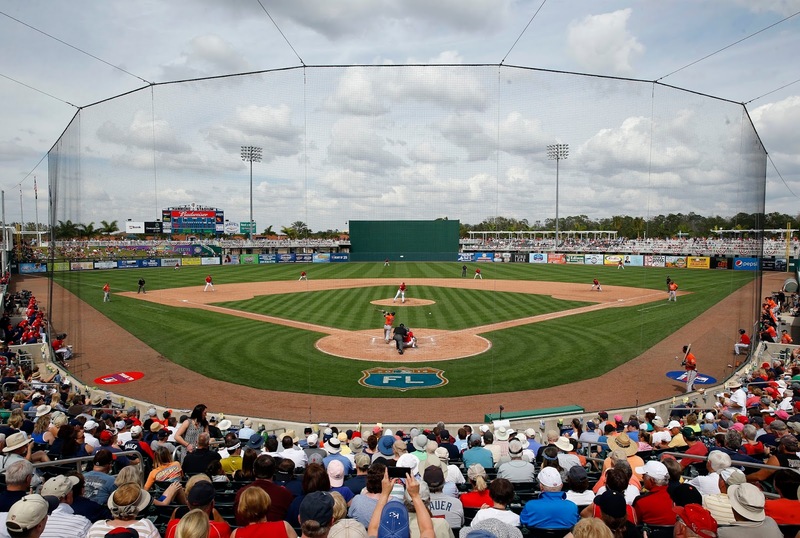 The Boston Red Sox opened their own state-of-the-art spring training complex in Fort Myers four years ago. 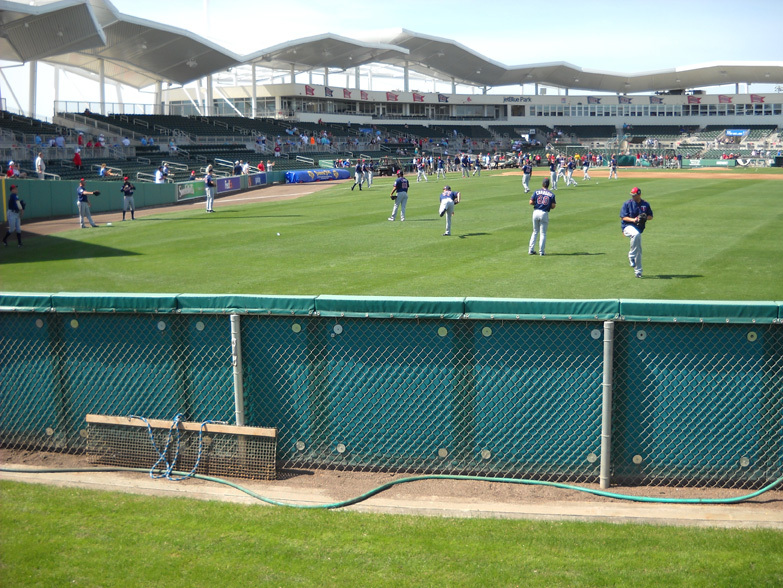 The opening of Jet Blue Park and its accompanying amenities triggered a clause in the Twins contract with Lee County that resulted in a multi-year series of upgrades to their complex. the Red Sox mascot, Wally the Green Monster. 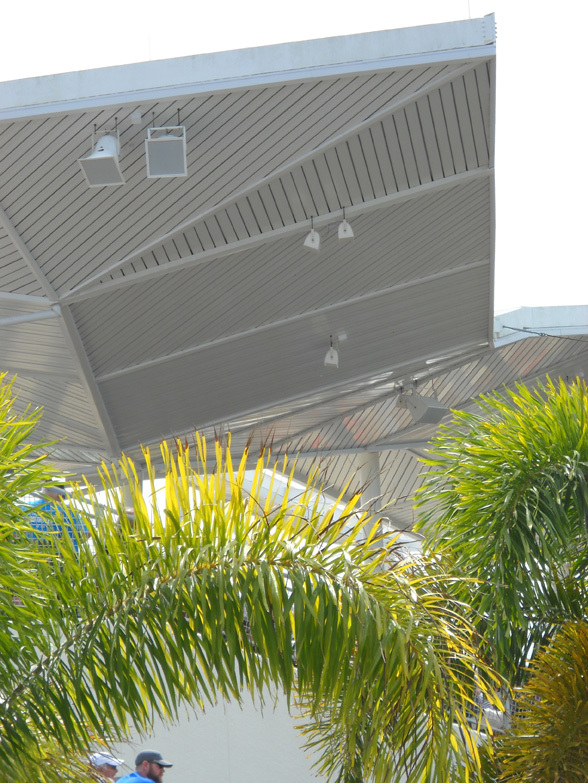 to our usher, to resist hurricane winds. on the stepladder changing a digit on the scoreboard. each inning to make the changes. honored numbers. No. 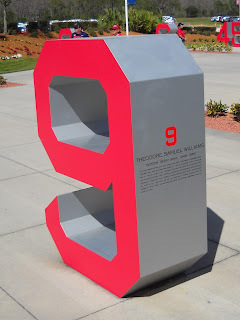 9 is for Ted Williams. 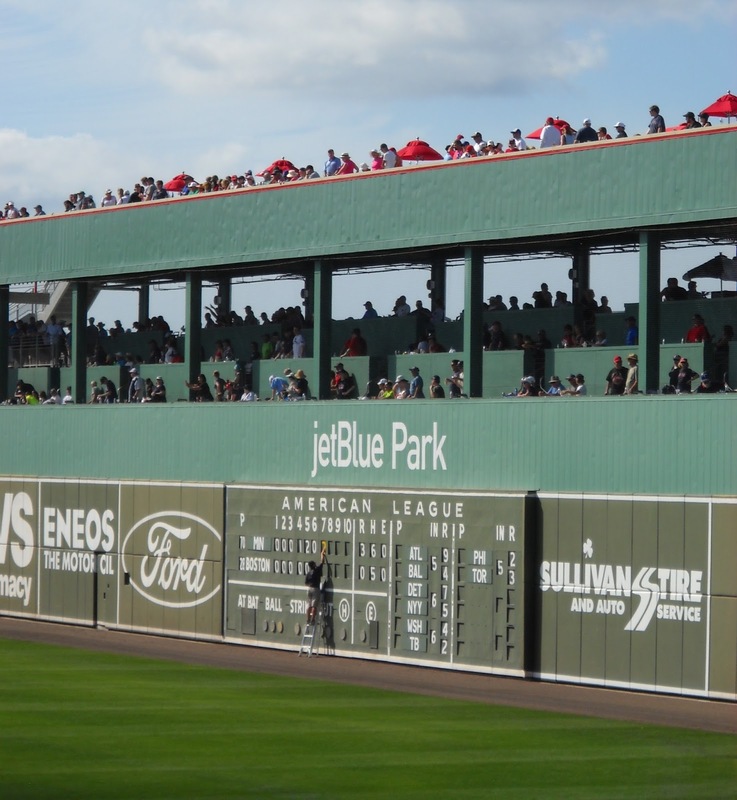 Jet Blue does not host a team in the Florida State League. 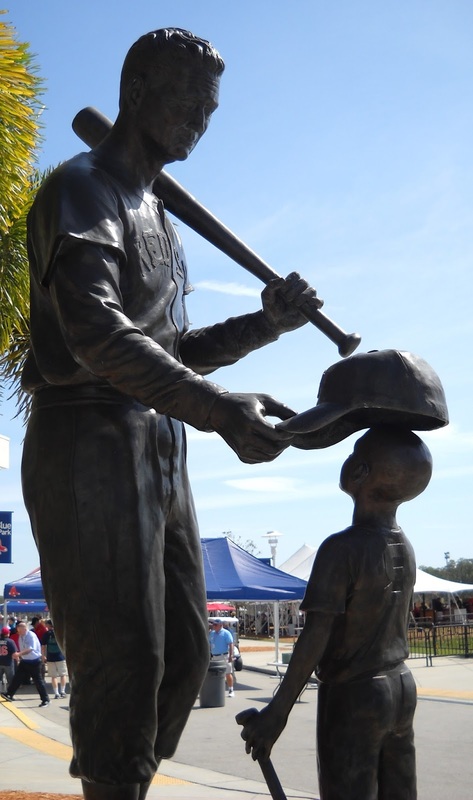 The Fort Myers Miracle, which plays at Hammond Stadium, is affiliated with the Twins and has been for decades. The Sox' High-A affilate is in the Carolina League. The Sox do have a team in the very low-level Gulf Coast League, a so-called complex league; GCL games are typically played on the back fields. So Jet Blue, once spring training ends, is basically used as a concert venue. in the Tampa Bay Rays' spring training park in Port Charlotte. I wrote the Monday print column, largely on Byung Ho Park and the uncertain expectations for the Korean slugger, on Saturday evening . I was in the air between Fort Myers and MSP when Park hit his first spring training homer on Sunday. Sunday was also his first appearance in the field this spring. He had been the starting designated hitter in the Twins' first four games, and I didn't expect him to be in the lineup at all on Sunday. I can't recall the last guy who started five days in a row in Grapefruit League play, much less five straight at the start. My seats for the Saturday game (against the Baltimore Orioles) were close to first base, and Park was one of three players working at first during pregame infield drills, the others being starter Joe Mauer and James Beresford, who handled first for the final four innings of the game. Tom Kelly was hovering and talking frequently with Park, at one point grabbing Park by his pants pocket to pull him back to get his attention. The interpreter wasn't there, so I don't know how much of what TK was telling Park was getting through. At one point Park tried to dig a low throw out of the dirt. Kelly let out a yelp of disappointment when he saw the ball still on the ground. TK has been known to make certain infielders, and first basemen in particular, pet projects during spring training, and I wouldn't be surprised if Park (a) is deemed a little weak on scooping throws and (b) that makes him a TK project. on the park's Fenway scoreboard replica. Jet Blue Park, the spring training home of the Red Sox, was designed to match Fenway Park's dimensions. 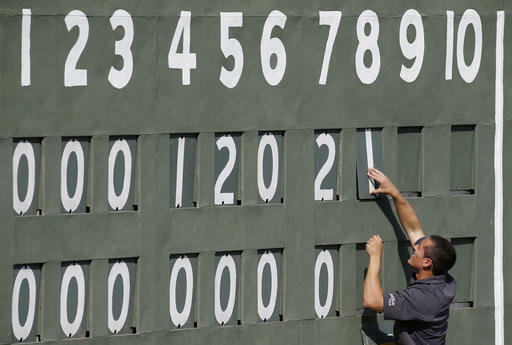 Part of that -- the most famous -- is the "Green Monster," Fenway's mammoth left field wall, which features a hand-operated scoreboard. The original scoreboard is run from inside. Which is how I figured it was done in "Fenway South." This had my wife speculating that the help wanted ad for the job included a line that said something like: "Must be able to sprint while carrying a ladder." The Twins hit the road Friday (playing to a 2-2 tie with the Pirates), and the wife and I had our usual day on Sanibel Island. It was a baseball-free day. More or less. I did eye the Twins lineup for the game in Bradenton, and noted that Danny Santana was slated to start at third base. Friday was the third spring game for the Twins, and the third game in which Santana appeared -- and at four different positions. He took over center field when Byron Buxton left the first game and was the sub for Miguel Sano in right in the second game (in which Santana homered). And on Friday he started at third and moved to second later in the game, playing all nine innings. Quite a difference from last spring, when the Twins pretended that there was a shortstop competition between Santana and Eduardo Escobar. The competition was, in truth, merely lip service; Santana was never used in spring training other than at shortstop. As things turned out, Santana neither hit nor fielded competently during the regular season. This spring, Escobar is ensconced as the shortstop, and Santana -- who is out of options -- has to make the team as a utility guy. Oh, he may be Plan B for center field. Or maybe Max Kepler is. But Byron Buxton is Plan A, and one aspect of the Twins bench this year figures to be the need for a fourth outfielder who can be used not only as a backup in center field but as a defensive substitute for Miguel Sano in right. Figure that the Twins will open the season with 12 pitchers. That leaves room on the roster for 13 position players, nine of them regulars (including the DH) and four as reserves. One of the four, obviously, will be the second catcher. If Santana is capable of being both the backup middle infielder and the glove-oriented fourth outfielder, it would open up a lot of other possibilities. Miguel Sano got lost on a ball hit over his head in a three-run Red Sox inning. I'm not saying it was an easy play, and I'm not saying every major league right fielder makes that play, but I will say it was a ball I expect a major league right fielder to catch. He didn't. Ricky Nolasco, who gave up those three runs, hit 92 mph on the scoreboard velocity readings with frequency. On the other hand, he needed 37 pitches to get four outs, and this was against a lineup of scrubs and minor leaguers; the Red Sox brought no regulars to Hammond Stadium. Taylor Rogers, who is prominent on my list of lefty relief candidates, gave up three runs before recording an out in the eighth inning. None of these events necessarily establishes anything -- it's the second spring training game, after all -- but they are perhaps predictive. Nolasco ... my hope has been that he'll show enough to pique the interest of some club that needs a starter. The line score from this outing is ugly, but Sano was part of the problem. More important, if the stadium gun reading is accurate, he still might attract some interest. Rogers hit the first man he faced, then gave up double, double, single and walk before retiring three in a row. Ugly outing, without question, but he found his way out of it. He didn't help his cause with the first five batters, but he might have saved his cause with the next three. 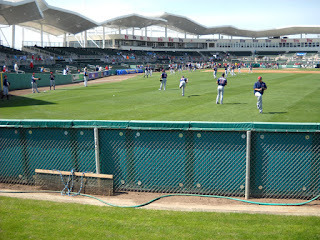 My seat for Wednesday's Twins exhibition opener were in the right-field bleachers of JetBlue Park, home of the Boston Red Sox. If I had poor seats for watching the hitters, I had a pretty good location to watch Sano play right field. The only problem was, the ball never found him. The closest he came to touching the ball was a fly to right center that Byron Buxton gobbled up. Sano broke well on that ball, but Buxton had it easily. The Twins started Oswaldo Arcia in left, Buxton in center and Sano in right. They left the game en masse about halfway through, and the Twins had Darrin Mastroianni in left, Danny Santana in center and Max Kepler in right. There are three center fielders in that second outfield, but none of them are close to Buxton. Buxton fanned his first two trips, then singled home the first run of the game before giving way to Santana. I've said this before; his defensive abilities alone make Buxton the obvious choice for center field -- all the more so if Sano is going to be in one of the corners. 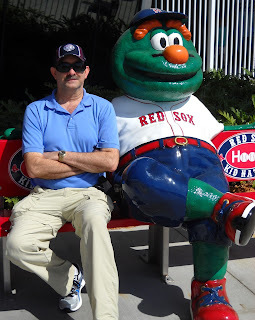 I'm in Fort Myers now despite multiple brain cramps en route, and I'll be at JetBlue Park, the "Fenway South" home of the Red Sox, for the Twins' exhibition opener today. 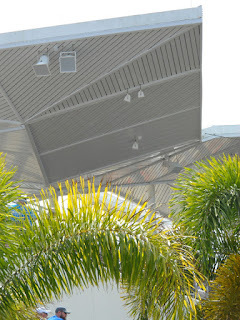 I've not been there on my previous trips to southwest Florida, and I'm looking forward to it. The lineup the Twins are bringing to the crosstown contest features players I'm particularly interested in seeing: Byron Buxton in center, Miguel Sano in right, Byung Ho Park at DH, John Ryan Murphy behind the plate. These are four guys the Twins really need to see come through. On the noumd, it's Phil Hughes starting with Trevor May "piggybacking." Aroldis Chapman, star reliever now with the New York Yankees, got a 30-game suspension out of his domestic incident case. That's not long enough to keep him from free agency after the season, but it's also shorter than a PED suspension. Craig Calcaterra reasonably suggests that this was effectively a plea bargain, especially considering that Chapman agreed not to appeal the ruling. So a precedent of sorts is set. Nobody was injured and there were no charges filed in the Chapman incident, but he did fire a gun. We'll see what happens in other cases, including the pending Jose Reyes case involving the Colorado shortstop. The Kansas City Royals signed Salvador Perez to a contract extension through 2021. I wonder if the Royals will ease up on their use of him now that they're committed to him for another five years. 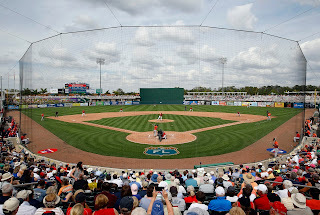 Even though spring training camps have been open a while and the exhibition season gets started this week -- the Twins' first game is Wednesday at the Red Sox facility in Fort Myers -- there are still players signing deals. When the Blue Jays released him last June after a foot infection halted his rehab, the word was that Santana intended to pitch winter ball. As far as I can tell, that didn't happen. He certainly hasn't found a team that thinks him worth the rehab investment this year. Considering the long layoff, considering that he turns 37 this month, that's hardly surprising. So this may be it for Johan Santana. If so, he becomes just another player who baseball let go before he was ready to let go of baseball.